There are many questions for a Technician to think about when an engine oil light illuminates, or the oil pressure gauge indicates low or high pressure. Is the condition created by an engine mechanical fault, hydraulic inconsistencies or electrical component / system fault? With modern vehicles utilising thinner oils and reducing internal engine friction designs, the oil consumption on many of these vehicles dramatically increases to a point where the oil level of the engine may require topping up between services and in some cases more than once. If the vehicle utilises an oil level sensor, the early warning display generally allows the driver time to top up oil levels prior to any major disaster. A vehicle without the level sensor may be driven to a point where the oil pressure is compromised. Checking for correct oil level is the first priority when any oil warning light is illuminated. Note: it is important that the oil level is within the correct range and not over or under required limits as both conditions may cause excessive engine damage. An illuminated oil pressure light may require the physical monitoring of the oil pressure with the use of a pressure gauge. Generally lower than normal oil pressure may create greater than normal engine operating noises. 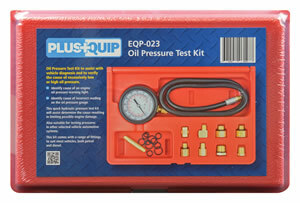 The PlusQuip EQP-023 will allow the technician to accurately monitor actual engine oil pressure. An acceptable engine oil pressure reading with an illuminated engine oil warning light would require investigation of the Oil pressure sensor/switch and related circuitry. How is the oil pressure switch tested? Note: To accurately test the oil pressure switch, it is important to determine the type of switch or sensor fitted. Generally, the oil switch activating a warning light only utilises integrated contacts that may be either in an Open or Closed position. With the engine not running (specified as normally open or closed in parts listings) a simple Ohm meter test can identify if the contacts open or close with oil pressure supply. Checking circuit voltage supply is also required if the internal contacts function correctly. A typical simple circuit shown below. Altering internal sensor resistance in response to changes in engine oil pressure will cause the oil pressure gauge needle to move. This operation may also be tested with a Multimeter or suitable Oscilloscope. 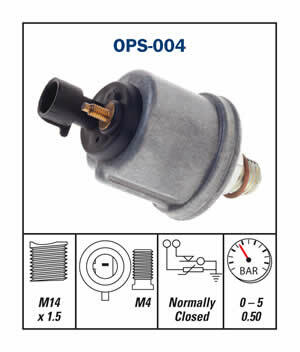 Combination oil pressure switches and gauge sensor units may be found on some vehicles. These circuits are to be tested separately. Electronic oil pressure sensors are common on many later systems and operate in conjunction with engine oil temperature sensors to monitor changes in engine oil viscosity for greater control of variable cam timing. A typical VE Commodore oil pressure sensor system is shown below. Ensure voltage reference and ground circuit is acceptable prior to any oil sensor replacements. Note: It is important not to over tighten these sensors as damage to the sensor internals may occur. Also note all oil pressure switches and sensors are susceptible to oil leakage under pressure. The Premier Auto Trade Oil Pressure Switches and Senders (OPS) program now includes almost 150 part numbers covering over 16 million vehicle applications in Australia and NZ. When you supply and fit products from Premier Auto Trade you can expect a product designed and tested to the vehicle manufacturer’s specifications offering OE form, fit and function. Premier Auto Trade distributes products throughout Australia via a network of specialised resellers and leading automotive groups.